Navy Federal Credit Union offers high-earning savings accounts and checking accounts to members of the credit union. As you may gather from its name, the credit union is available only to servicemembers, veterans, Department of Defense Civilians and family members of these groups, whether Army, Marine Corps, Navy, Air Force or Coast Guard. If you qualify for membership, you’ll be able to benefit from a wide variety of bank accounts. Plus, each account earns at a competitive interest rate that performs better than most big banks. This can boost your savings substantially and provide the perks of a credit union, like lower fees and community building. NFCU does not have separate IRAs. Instead, you can open six various accounts as an IRA. Navy Federal Credit Union started back in 1933 with a mere seven members. Today, the credit union has over 7 million members, with branches and ATMs all over the world. The credit union is available to servicemembers and veterans of various affiliations, their family members and Department of Defense civilians. Plus, you can continue to be a member of NFCU even if you leave the military, change employers, move, retire or get married. When you bank with NFCU, you’ll have access to thousands of free ATMs not only across the country, but around the world, as well. You also have the option and opportunity to log in online and on mobile so you can manage your accounts easily on the go. Other perks include free bill pay, easy (and often free) check ordering, direct deposit options and overdraft services. Access to Your Savings Account Online, mobile, over the phone and at physical branches. 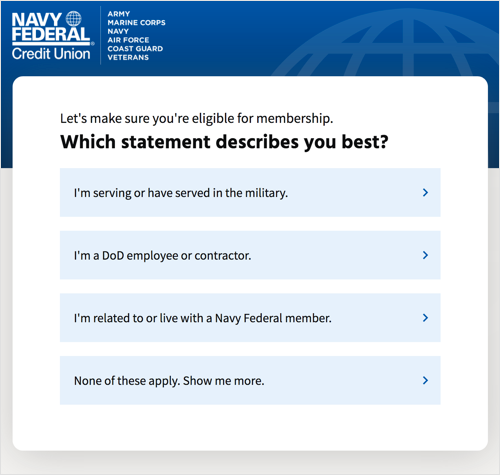 The Basic Savings account comes with your Navy Federal membership. (To find out more about becoming a member, see our section on NFCU membership below). The account certainly is simple, without any extra perks or benefits. Even its interest rate performs at the national average. Technically not labeled as a CD account, the SaveFirst® Account is available in various terms from three months to five years. You have a ton of flexibility with this account, since you can choose your own term length and maturity date. Plus, unlike most CDs, you can make deposits to your account at any time during its term. This can come in handy especially since the account earns at an above-average rate. Interest is compounded daily and credited monthly. Access to Your CD Online, mobile, over the phone and at physical branches. This CD account is one of Navy Federal Credit Union’s special, limited-time certificates of deposit. It has a low minimum deposit requirement. Plus, you can make additional deposits at any time. There is no minimum amount for those additional deposits, only a maximum of $50,000. With its extremely high interest rate, this certificate account can certainly give you an easy head start towards your savings goals. You’ll also benefit from its low minimum deposit requirement of $50 and the ability to make additional deposits (up to $3,000) at any time during the term. This Special Certificate can be opened as a regular account, an IRA or an ESA. Just like its Special Certificate counterpart, the regular EasyStart Certificates come as a 12-month term. However, you’ll need double the special minimum deposit to open an account. The interest rate drops, too, although not by much. On the other hand, the 3-Year Variable Certificate has an interest rate that adjust each year on the anniversary date of the account’s purchase. You’ll want to stay on top of your account just in case the rate does go down. This account also allows additional deposits, although you can only make these on the 12- and 24-month anniversary dates. You can open either of these certificates as a regular account, IRA or ESA. Interestingly, this account allows you to choose your minimum deposit amount from five set amounts. The lowest amount lands at $1,000. The minimum amount you choose and deposit will determine your interest rates. You have 11 term choices between three months and seven years. Typically the longer the term length and the higher your balance, the higher your rate will be. These are all available as IRAs and ESAs. Access to Your Money Market Account Online, mobile, over the phone and at physical branches. The Money Market Savings Account offers higher rates than a Basic Savings Account. You also have the opportunity to boost your rate with higher balances. However, the cost of this perk is a higher minimum deposit requirement and steep balance tiers to reach higher rates. It’s important to note that NFCU bases these balance tiers on the money market environment and may change weekly. This account allows for additional deposits at any time and in any amount. As a money market account, it also includes check-writing abilities with one complimentary check order. The dividends on this account are earned daily and credited to the account at the end of each month. You can also open this account as an IRA or an ESA. As indicated by the “Jumbo” in its name, this account requires a pretty substantial minimum deposit to qualify. If your account balance drops below this requirement, you’ll earn at rates according to the regular Savings account. Luckily, you can make additional deposits at any time. This account both compounds and credits dividends monthly. Again, the dividend rate is based on money market environment and may change weekly, so you’ll want to keep an eye on your account(s). You can open this account as a Jumbo IRA Money Market Savings Account. Access to Your Checking Account Online, mobile, over the phone and at physical branches. The Free Active Duty Checking® Account is designed for military life. It requires a qualifying military direct deposit made to the account each statement cycle. Account holders can benefit from ATM rebates up to $20, free checks for the life of the account and easy online and mobile access. This is the credit union’s more basic checking account. You won’t ever have to worry about paying a monthly service fee or meeting a balance minimum. The only fees you could face (and should avoid) are those for PLUS® System ATMs, non-sufficient funds transactions, returned checks, dormant accounts, stop payments and overdraft services. This checking account is designed for students between the ages of 14 and 24. This allows students to learn more about money management, with the benefits of an interest-earning account. The learning process is made easier, too, without minimum deposits and fees to worry about. Plus, students can receive up to $10 in ATM fee rebates per statement cycle. Opening a Flagship Checking account gives you the opportunity to earn at higher rates with higher account balances. Note that while there is no minimum deposit requirement, you do need at least $1,500 in the account to earn interest. If you set up direct deposit to this checking account, you’ll be eligible for ATM fee rebates up to $10. This last checking account is advertised as focusing more on electronic convenience. You get to avoid the low monthly fee by setting up direct deposit. You’ll also be able to receive up to $10 in ATM rebates per statement cycle. You can open five of the above accounts as ESAs. When you open a savings account as an ESA, it becomes focused on savings for education expenses like tuition and textbooks. ESAs are offered by Navy Federal Credit Union’s My College Central. The contributions made to this account are not tax-deductible. However, the earnings of this savings account are tax-free when you use the funds for education expenses. Students can be the beneficiary one more than one ESA. Keep in mind that you cannot contribute more than $2,000 to ESAs. Where Can I Find Navy Federal Credit Union? You can find NFCU in the Washington, D.C. metro area, Hampton Roads, Virginia, San Diego, California, and Jacksonville, Florida. For credit union members overseas, you can find locations in Africa, Bahrain, Cuba, Diego Garcia, Greece, Guam, Italy, Japan, Korea, Okinawa, Singapore and Spain. You can also find NFCU online and on mobile, whether through its app or on your browser. What Can You Do Online With Navy Federal Credit Union? You can start by browsing the credit union’s many product offerings from education savings accounts to auto loans and credit cards. If you see anything you like, you can apply to these accounts right from the website, too, by clicking an orange “OPEN NOW” button for the account you’d like to open. You need to be a member of the Navy Federal Credit Union to open an account with the company. Luckily, you can also apply for membership online by clicking an orange “JOIN NOW” button. Once you have an account with the credit union, you can access your accounts online, whether on a laptop, desktop or on a mobile device. You just need your account Username and password to log in, as shown here. The NFCU website also has a Live Chat option, where you can easily reach a customer service representative who is happy to help solve problems and answer your questions. You can access your money online, on the mobile app, at a branch or ATM or over the phone. You’ll need your ATM or debit card to access your accounts at an ATM. When banking online or on your mobile device, you log into your account with your online banking username and password that you set with the credit union. How Can I Save More Money With a Navy Federal Credit Union Account? As a credit union, NFCU is able to offer interest rates that earn more than even some big banks. Even the Basic Savings account performs well above the interest rates of big banks’ savings accounts. These favorable rates allow you to save even faster and see those results sooner. Most NFCU accounts do have minimum deposit requirements. With the exception of a Jumbo Money Market account and some Standard Certificates, these amounts don’t reach astronomical levels. Even so, higher amounts do allow you to start saving more right off the bat. Plus, you don’t have to worry about monthly fees ever taking out a chunk of your savings. Certain accounts do earn interest at tiered levels. With these accounts, you can save more by having higher account balances. What’s the Process for Opening an Account With Navy Federal Credit Union? To open an account with NFCU, you will need to be a member of the credit union first. Membership requirements are detailed in the following section. You'll need to choose your affiliation as the first step of the application process, shown here. Once you’re a member, you can easily open an account online. You just have to click the “OPEN NOW” button for the account you want. If you’re not already signed into your online account, you’ll be prompted to log in to continue the application process. There are three groups for NFCU membership. The first involves servicemembers and veterans. In this category, you are eligible if you are an Active Duty member of the Army, Marine Corps, Navy, Air Force or Coast Guard; Army and Air National Guard; Delayed Entry Program (DEP); DoD; Officer Candidate or ROTC; DoD Reservist; or veterans, retirees and annuitants. The second group is for Department of Defense civilians. You are eligible in this group if you are a DoD civilian employee; U.S. Government employee assigned to DoD installations; DoD contractor assigned to U.S. Government installations; or DoD civilian retirees and annuitants. Finally, family members may be able to qualify for NFCU membership. This includes immediate family members of current credit union members and those who are eligible for membership (but not members). Immediate family includes parents, grandparents, spouses, siblings, children (including adopted and stepchildren, grandchildren and household members. If you’re unsure whether you or a family member qualify, you can contact the credit union over the phone or at a branch. Every applicant will need to provide personal information during the application process. This includes your Social Security number, government ID, home address, bank account information, phone number and email address. If you are a family member applying for membership, you’ll also need to provide your family member’s (sponsor’s) last name, Access Number or Social Security Number, date of birth and affiliation (Army, Navy, etc.). The main catch to banking with Navy Federal Credit Union may be that you don’t qualify for membership. However, this is how credit unions work. 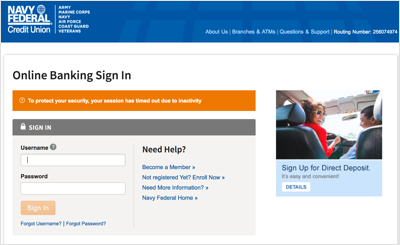 So if you’re not an eligible servicemember, veteran, DoD civilian or family member, you won’t be able to use NFCU’s products and services. Another possible catch here is that certain accounts do have relatively high minimum deposit requirements. This is mostly reserved for certificates and money market savings accounts. Navy Federal Credit Union is a great banking option for servicemembers and their family members, veterans and DoD civilians. As a credit union, you’ll find a more personal and community-like feel. Plus, you’ll benefit from more favorable interest rates and fees. Most of the above accounts don’t even charge a monthly service fee, allowing you to focus solely on saving. With a wide variety of account types, you’re sure to find an account that fits your financial needs and goals.